Phew! Have been round to see my Dad this morning and I am thrilled to say that all the seedlings are pretty much how I left them and I will still have a selection of plants for my garden come Spring time – Yay! I have found a rather wintry picture of my old garden for you to see. 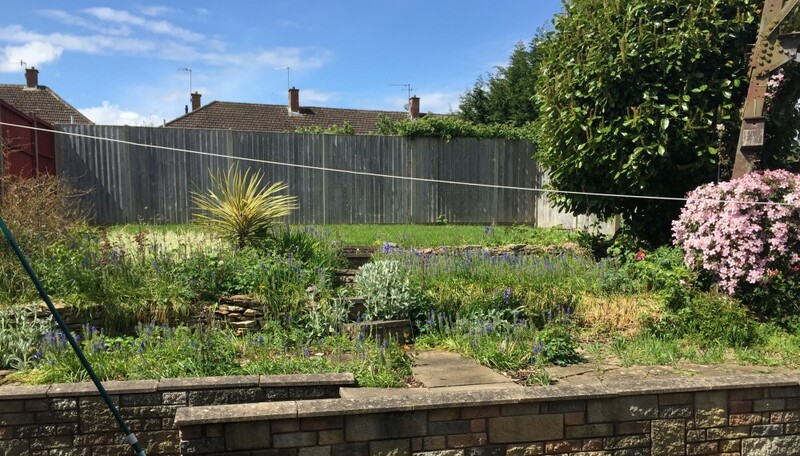 This should give you an idea of the long, flat garden I left behind and help you to understand the learning curve I have when it comes to gardening on a slope. As you can see, a much larger space which I miss, but the soil was a heavy, wet clay which I can guarantee you I don’t miss! Also, please don’t think that this amount of snow is normal for where I live – it isn’t. I live in Worcester and it NEVER snows here. This couple of inches was enough to put the whole city into lock down for about 2 days – pathetic! Annoyingly, we have been hit with another day of strong wind, with gusts in the region of 45 -50 mph. I think you’ll agree not great weather for gardening and certainly not ideal weather for putting up my polytunnel 😦 We have been forecast the same for tomorrow so am feeling more than a little frustrated that I am not able to get into the garden. So, after a quick phone call, he then told me that he had found the water sprayer and has given them a good drink. I am not able to go up to theirs’ until tomorrow, but fingers crossed the majority of them will have survived. Apparently. he “meant” to water them the other day for me as Mum had told him to (God bless her), but had forgotten as he started tying hooks for a fishing competition he had on Friday!!! So, whilst I worry that the gorgeous ‘Duchess Yellow’ Aster’s I had planned for my new garden might not actually make it now, I still need to focus on everything else. I had mentioned my invading weed problem to my Mum’s neighbour Wendy, an inspirational woman who completely blames me for her newly revived passion in gardening :). Last spring, she had her lawn replaced with artificial turf (not for everyone’s taste, but to be fair, the contractors she used did a fantastic job) and she has given me some ‘industrial strength’ weed control matting which they used under the tur when they laid it. Have never seen anything quite like it – it’s so thick!! Certainly haven’t spotted anything like this anywhere near here. So, as soon as the weather picks up (fingers crossed) I will get as much of this down as I can. There’s a good 20m here so I should be able to cover the majority of the garden that is still exposed. I haven’t been feeling ‘quite right’ lately and I am afraid to say, a little down. I think the fact that starting to write this blog and the invigoration it has given me to get back in the garden whilst the weather has been so awful and I haven’t actually been able to get out there has something to do with it. I read with envy all of the gardener’s out there who are planting their Spring bulbs knowing full well that it could be a good 6 months before I am able to enjoy the same pleasure. Having never committed myself to such a massive gardening project before, it can feel like a constant up-hill battle. I long for those warm days where I can potter around the garden enjoying my own handy work, but at the moment that feels like it is a lifetime away. With the weather being as rotten as it is at the moment and with the forecast for the next few days being equally as depressing, I am using the time constructively, attempting to come up with ideas for my new garden. With all the posts I have been posting, you may think I have completely finished stripping everything out – chance would be a fine thing! It’s starting to feel like a losing battle as the mild, wet Autumn we have had so far has been an absolute dream for the weeds which are already taking over areas that I had already cleared out once! As you can see, all the plants I wanted to store over winter are all now nicely dying down since we had our first decent frost of the year last week. They are all looking a bit tired, but with a bit of TLC, they will be just fine. I have been looking through countless magazines and searching the internet for examples of gardens that are on a slope, and ways of reducing the steepness of it as much as I can. Problem is, there seems to be a general consensus amongst the gardens that I have come across so far that rockeries and winding steps are the way to go. Neither option really appeals to me. In a nutshell, I would like a cottage style garden (borders full of a large variety of plants with lots of colour) with a contemporary twist (clean lines and edges). Now, I am not daft and I know that both those elements are completely contradictory, but it’s what I want. And just to make things slightly more interesting, I want specifically designated areas to grow salad, veg, fruits and herbs. What do you think? Personally, I think it’s completely fab and will make the patio area look so much nicer. Now, I just need to convince Trist to help me get the old stuff up and lay it!! Apologies for not posting for a couple of days, but I have been making the most of the mild and dry spell of weather and have been, where else, but in the garden. Whilst reviewing my handy work so far, a rather pleasing thought dawned on me. I am actually in a really privileged position with my whole garden project. I have no emotional attachment to anything in the garden as it stands which means I am completely free to rip anything and everything out that I want to without having to plan a new area or bed whilst trying to figure out how I am going to make an existing plant or feature ‘fit’. I am literally free as a bird with a blank canvas. How exciting (and more than a little daunting!) is that???? Whilst rifling through my garden photos, I came across one I took of the first bunch of Sweet Peas that came out of my new garden. Such a beautiful pink! Thankfully there were masses of them as my garden needed a shot of colour! I have found a garden design tool, which on the surface looks fab and what’s more, it’s completely free. I haven’t had a proper play with it as yet, but as soon as I do, I will upload some ideas that I have for my makeover! So, after tackling the top bed, I decided to move to the bottom bed on the left hand side. This area is the shadiest part of the garden and the dampness of the soil confirmed this. The crazy paving that was in this area was a real issue to lift and I endured several hours swinging my frustrations out with a lump hammer. I also needed a little ‘man help’! By the end of it, the area was looking much clearer and I was happy to think that I was making some real progress. As we’re still getting to know one another, I thought it would be a good time to introduce “My Team”. Each member brings their own skills and expertise to the operation (sort of!) and I couldn’t do what I do without them. We’ll start with Will, my Son, who you have briefly been introduced to. William is the one thing in my life I feel I have got right and I am so incredibly proud of the young man he is becoming. At 9 years old and completely obsessed with Minecraft, he is always willing to help me in the garden as long as it doesn’t involve, worms or spiders. We are planning for Will to have his own area of the garden as he is keen to grow his own salad, fruit and veg. I look forward to sharing his endeavours with you! My ‘Partner in Crime’ when it comes to Gardening. We both enjoy spending time pottering around our gardens and both have a keen interest in plants. Our joint passion of gardening has brought us closer together and she is the one person I can rely on when I am not feeling myself. No one understands me better than her! We both believe that our passion for Gardening comes from my Grandad, my Mum’s Dad. Unfortunately he died when I was only 11, but EVERY SINGLE memory I have of him is in the garden. My Mum inherited his greenhouse after he died and even though one hasn’t been used in the greenhouse for 20+ years, you can still smell the paraffin from his heater when the door has been closed for a while. It’s nice to think he smiles down on us whilst we are working in there. I cannot tell you how much I appreciate this member of my team. He spends hours outside with me and never leaves my side whilst I am sowing seeds or sieving soil. We have had Spot since he was 5 months old and he is someone I can talk to all day and he never answers back lol! He loves being outside with me and never complains come rain or shine! The miserable, but sensible one of the team. Will happily join us outside if the sun is shining, but if there is even a threat of rain – you’ve got no chance! We got Dotty about 4 years ago as a Rescue and she is so stuck in her ways, there is no changing her. On a Sunny day she can be found sprawled out in the dirt, catching some rays. Our newest recruit! We got Bella on Halloween 2015 and she is a little cutie. Having not experienced a season in the garden with her yet, I am unable to comment on her usefulness, but I am sure updates on her progress will follow! So that’s us, Team BloominBootiful!